On 26 June 1955, a C-124 departed Dover AFB for RAF Burtonwood, England via Harmon AFB, Newfoundland and Lajes Field in the Azores. The purpose of this mission was threefold—to deliver much needed priority cargo and medical supplies to USAF bases in Europe, to film the documentary “This is Dover Air Force Base” and to deliver Dover’s entry to the Dover, England’s 49th Annual Flower Show and National Sweet Pea Society’s Exhibition. This was a scheduled mission crewed by members of the 20th Air Transport Squadron of the 1607th Air Transport Wing and accompanied by Dover AFB’s information officer. He was given the special task of representing the mayor of Dover and the citizens of Delaware at the Annual National Show of the Sweet Pea Society of England by accompanying an array of Delaware sweet peas grown by a local greenhouse. These sweet peas were to serve as the official entry of Dover, Delaware. Upon arrival at Burtonwood, the aircrew showered, shaved and, not norm to the typical crew rest of the day, donned their Class A Blues and headed to town followed by the film crew to record their every move, “sightseeing.” Ugh! But for the information officer it was a long train ride down to Dover, England. Upon his arrival in Dover, he immediately grabbed a taxi to Connaught Park, the site of the famous sweet pea show. Met by the show’s secretary, he handed him the parcel of sweet peas and he quickly opened the box. To both their amazement, the flowers were in almost perfect condition after surviving four days in Old Shaky, a train and taxi ride and having traveled 3,500 miles. Dover, Delaware’s florist had specially prepared the flowers for their long journey. He placed the stem of each sweet pea in a test tube filled with water and sealed the top with a rubber cap. The flowers were then placed in excelsior to cushion any rough handling. At one end of the box, he placed a plastic sack filled with water so that a cool temperature would be maintained. The flowers were then placed on Old Shaky’s clamshell doors to maintain a constant temperature of 40 degrees and the rest is history. That is, of the 28 Dovers (Dover, Arkansas to Dover, Tasmania) that were invited to participate; only eight submitted entrees. Dover, Delaware’s sweet peas were the only flowers actually grown outside England. The others were in the form of telegraphed flowers which were sent from downtown Dover, England! Source: Taken in part from a report filed by the 1607th ATW Public Affairs Office, July 1955.
was one of the largest and busiest bases during World War II. Located between Manchester and Liverpool and two miles northwest of Warrington, it was initially responsible for the support of the 8th Air Force, then the 9th and ultimately the 12th and 15th Air Forces as well. 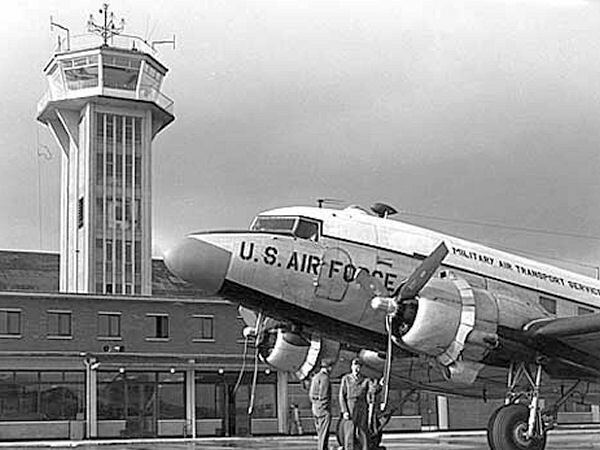 Following the war, the base returned to RAF control for two years as a maintenance depot and then reverted back to USAF control in 1948 undertaking all the major servicing for the C-54 Skymaster involved in the Berlin Airlift. Major redevelopment took place with the construction of the Header House (the largest warehouse in Europe at 3 million square feet), extending the main runway to over 9,000 feet and the construction of a new control tower and passenger terminal. Burtonwood, a popular stop for the MATS crews during the mid 1950s and early 60s, and Warrington with its Red Lion Pub served as a respite following the long over water legs from Newfoundland and the Azores. After eleven years of maximum use the base started its decline in 1959 and was closed by the USAF in 1965 reverting back to the Royal Air Force. Two years later the United States Army took command and remained until the base’s final closing in 1993, then occupying only a fraction of the original site.